The Science and Technology Facilities Council confirmed the UK's participation in the Large Synoptic Survey Telescope (LSST) this week, an international project that UCL astronomers have been involved in since 2013. 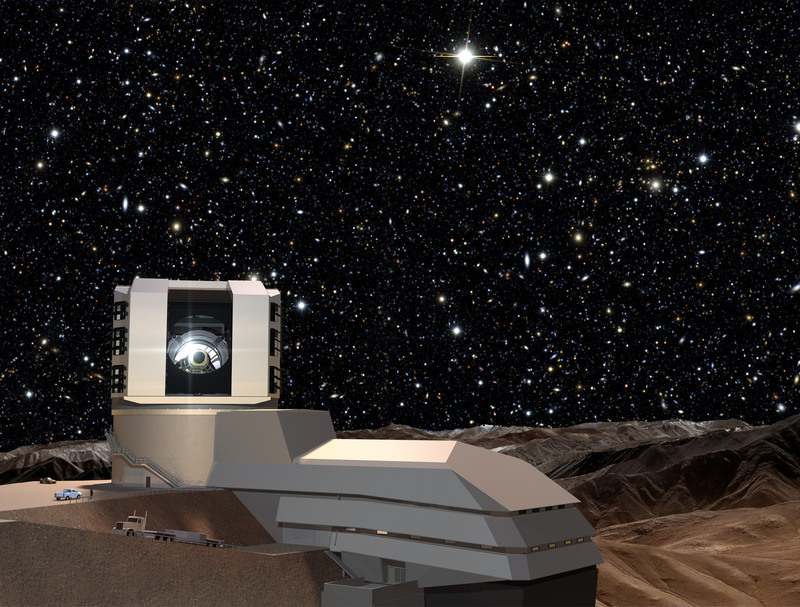 The LSST is being built in the Chilean Andes and will be the world's largest digital camera comprising 3.2 billion pixels. Once completed, it will be used by international astronomers to film the Universe to help uncover some of the mysteries of dark matter and dark energy as well as dangerous asteroids. The telescope will take images of areas of sky over 40 times the size of the moon which will enable scientists to build up a survey of the visible sky area in just three nights. This means that billions of previously unseen galaxies, stars and solar system objects will be seen for the first time and monitored over a 10 year period. Most of UCL's activity with LSST has focused on the Dark Energy Science Collaboration (DESC) with Dr Benjamin Joachimi, Professor Ofer Lahav, Dr Jason McEwen, Dr Tom Kitching and Professor Hiranya Peiris playing active roles and leading teams from UCL Physics & Astronomy and UCL MSSL. The researchers' interests include probing the cosmological model through weak gravitational lensing, clustering of galaxies, and huge explosions of stars in the distant universe known as supernovae, as well as the combination of all these probes. "We are excited to contribute to the design and analysis of one of the leading galaxy surveys of the coming decade, which will ideally complement the group's involvement in other big cosmological projects and support a broad scientific programme about the nature of dark matter and dark energy, the fundamental forces of nature, and the evolution of the Universe from its earliest stages until today," said Dr Joachimi, UCL Physics & Astronomy. Dr McEwen and Professor Peiris are additionally interested in the "Big-Data" problem of extracting science from LSST's eventual multi-petascale database. "The LSST will generate masses of data as it captures billions of objects in the Universe, in multicolour, every night. We are exploring ways of classifying each object as it varies over time and for this, we are looking to apply advanced machine learning methods. The LSST will create one of the World's largest data repositories when it launches and we'll be ready to analyse what it captures," added Professor Peiris, UCL Physics & Astronomy. Steven Kahn, the LSST Director, said, "It is great to see UK astronomers engaging in preparation for LSST, and we look forward to seeing our collaboration develop over the coming years. LSST will be one of the foremost astronomy projects in the next decades and the UK astronomical community will contribute strongly to its success." The project will achieve first light in 2020 and the main telescope sky survey will begin in 2022. Like all good movie franchises, the LSST story will unfold in stages, from a preview in 2023 to a finale in 2033.